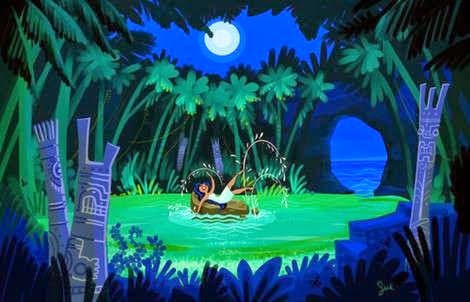 Above is the first concept art for Walt Disney Animation Studio's animated feature film "Moana." Disney currently is gearing up for the release of "Big Hero 6" which is hitting theaters in a few weeks, but that doesn't mean they aren't hard at work on several other films. One of them is "Moana." We had been told that "Moana," which concerns a South Pacific princess on an ocean voyage, would be coming in 2018. However, the production must be going well, because they have pushed "Moana" up to late 2016 - 23 November 2016 to be exact, Hollywood studios don't fool around when they reschedule films. Animation is a funny world, where you see things that aren't going to appear for two years. You'll be reading about this in 2016 as if it were today, or reading it then as if it were now, which is just kind of odd. That's show biz. We don't have many details about the plot, but 'Moana' tells the tale of of a Polynesian teen who sets sail to find a fabled island in ancient Oceania in the South Pacific. She's joined by the Polynesian mythological hero Maui, and together they'll come across mystical creatures, underworlds and lots of other crazy things on their adventure. "I grew up reading the novels of Melville and Conrad. And the South Seas, the exotic world that a lot of their stories are set in, was extremely intriguing to me," Musker said in an interview. "Just looking at the art which comes out that corner of the globe — the carvings, the statuary, the sculpture — I thought that it all begged for this bigger-than-life treatment that you can only get with animation." Musker brought forth the first African-American princess Tiana in 2009's 'The Princess and the Frog,' and now they extend that diversity even further. If it sounds like Disney's Hawaii-set 2002 animated film 'Lilo & Stitch,' well, it probably isn't. 'Lilo & Stitch' was more cutesy, while 'Moana' appears to be more dramatic and epic and, you know, 'important' in stature. Adding to the confusion is that 'Moana'' is a word that refers to a Hawaiian family line and name passed on from Moana Kāne, son of Keākealani Kāne the mōʻī (king) of Hawaii. This figure represents the beginning of the kaukau aliʻi service line of Hawaiian nobility up to Kanaʻina. Also, in the Hawaiian language "moana" means ocean. So why they picked 'Moana' as the title for a film that has nothing to do with Hawaii (apparently) is a bit of a mystery, but Disney does that sort of ethnic grab bag stuff a lot. Who knows if it was intentional - but 'Lilo & Stich' used various Hawaiian words such as 'kapu,' and it used the word 'ohana' pretty loosely but in an important context, so 'Moana' is probably not there by accident. In any event, Disney already has started the promo campaign for their 2016 films, so be prepared for more dribs and drabs of information over the coming 25 months, with the first "teaser" trailer probably hitting your computer screen during the summer of 2016.